The era of V8 Supercars dominance by Triple Eight RaceEngineering has come to an end. That is the brutally honest assessment by Roland Dane, theteam owner and driving force behind an operation which has won four V8Supercars championships in the last five years and five Bathurst 1000s in thelast seven. “I don’t believe we will be dominant in the way it hashappened in the past sometimes, be it HRT or Stones or us over the years,” hetold v8supercars.com.au. It might seem a harsh call considering Jamie Whincup leadsthe championship after two events and teammate Craig Lowndes is third. But in eight races this year – including the fournon-championship Australian grands prix sprints – Lowndes has won once andWhincup is yet to score a victory in his new Red Bull Racing Australia HoldenVF Commodore. 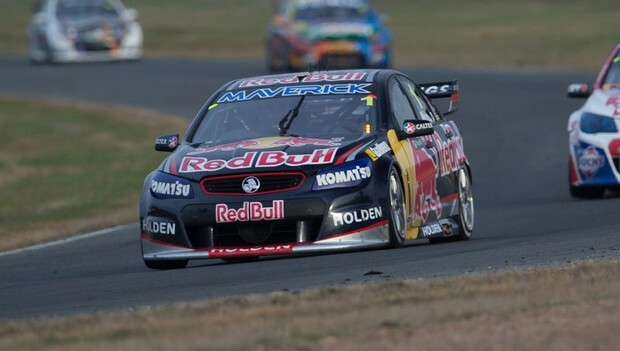 And at Symmons Plains last weekend in the Tasmania MicrosoftOffice 365, Whincup and Lowndes could manage only one podium between them overthe three soft tyre sprints that made up the event. However, if either Lowndes or Whincup win a race thisweekend it will bring up T8’s 50th win since swapping from Ford toHolden in 2010. Claim two and it will be 100 since entering the championship in2003. And if Lowndes wins one race, taking his tally to 91, hepasses Mark Skaife at the top of the championship all-time winners lost. Dane says the arrival of the Car of the Future technicalregulations in 2013, which control and commonise many parts, is fundamental toTriple Eight’s slide from dominance. “Part of the whole reason for Car of the Future was to tryand ensure the playing field is as level as reasonably possible in the sport,”said Dane. “And we always knew that being able to be dominant, for instance theway FPR and Triple Eight were last year, was highly unlikely to happen. In the shorter term the Triple Eight engineering team’sstruggle to come to terms with the soft tyre is a major issue. At SymmonsPlains, Brad Jones Racing won all three races via Fabian Coulthard and JasonBright. Part of BJR’s success has been attributed to the commerciallyavailable Triple Eight front-end suspension system it runs in its Commodores,while T8 also supplies complete cars to Lucas Dumbrell Motorsport and TeknoAutosports. Shane van Gisbergen beat home Whincup and Lowndes for victory inrace two at the Clipsal 500 in his Tekno VIP Pet Foods Commodore. But Dane is philosophical about helping the competition beathis own factory-backed Holdens. With a hectic schedule of local and international racinglooming, Dane said Triple Eight was unlikely to test again until after theTownville event in July. But he said development of the team’s race cars wouldbe continuous.